Join us for a morning event, as part of the Venturefest series, looking at the REPLICATE project’s plans, progress and challenges. The event is aimed at people interested in the themes of smart energy and mobility, including: academics, smart / future city followers and urban planners. 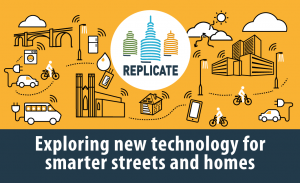 The REPLICATE project is exploring new technology for smarter streets and homes. The project will research how smart technology around mobility, energy and city infrastructure could benefit local people and neighbourhoods, with an initial focus in the Ashley, Easton and Lawrence Hill area of Bristol. Come along and hear about plans, progress and challenges in delivering Bristol’s first smart city district. There’ll be plenty of audience interaction with a Q&A and panel discussion. Hear from partners delivering the Bristol project and academics working on the project. We’ll discuss our work around smart energy – introducing connected household appliances to better manage energy use and save residents money on their energy bills, alongside more efficient district heating and local solar energy. We’ll also cover the smart mobility aspects of the REPLICATE project: adding more EV charging, an employee-based electric bike scheme, shared use electric vehicles and new journey planning tools. REPLICATE is a 5 year project supported by the European Commission. It brings together 11 partner organisations working on the Bristol project. The ultimate aim of this European project is to explore the potential for this technology and how it can be scaled up and replicated in other cities. Registration for the event is from 8.30am then the event starts at 9am. There’ll be tea, coffee and pastries available from 8.30am.